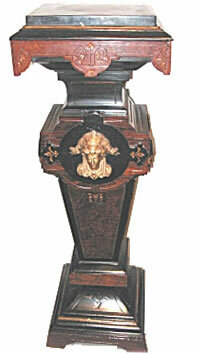 Joan Bogart is has been in the business of antiques since the 70's. With special passions for Victorian lighting and Belter furniture her expertise is sought after by writers, museums and historical societies. Parts of Joan's collection have been featured in a number of movie productions, museums and today augments the Victorian decor of many a home. Joan Bogart has been in the antiques business since the mid 1970's. She has always specialized in high style 19thCentruy American Furniture Chandeliers and Accessories but also has a passion for anything related to the Victorian era. Joan has appeared and has lectured on the subject for museums and symposiums, appeared on TV with her collections, and has been written up in articles both in Victorian Homes and Old House Interior's, The New York Times & Newsday, as well as numerous antiques periodicals. Additionally, she has often consulted with various museums and historical societies related to the authenticity and relationships of different peices with a special passion for Belter furnishings. That is why when Martin Sorcesese was creating "The Age of Innocence " she was contacted and furnished the elegant and wealthy grandmother's home. Both her lighting, furniture, and accessories were in this movie. All of these items have been sold but similar items are in inventory. Joan has also rented to "Washington Square", and most recently to Steven Spielberg's "Amistad". In that movie her lighting was especially important, and when the interior of the "White House" was shown her argand lamps were prominently placed on the mantle, and are currently in inventory as are most of the astral lamps rented to the movie. However, the studio did purchase antiques for a prop warehouse they were opening. Museums have also bought heavily form Joan over the years, including, The Metropolitan Museum of Art, The Smithsonian Museum, The High Museum of Art, The Museum of Fine Arts in Houston, The Strong Museum, The Louisiana State Museum, The Governor's Mansion for the State of Mo. The Treasury Dep't. along with numerous Southern and Mid- Western House Museums. She also regularly consults with museums and historical societies related to the authenticity and relationships of peices. 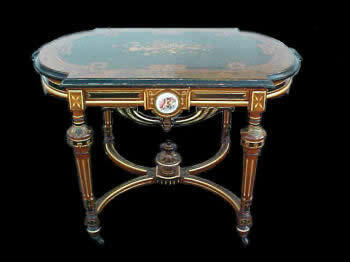 Now via the internet these beautiful Victorian antiques are accessible to you. There are many price levels available in her extensive inventory, and she is willing to work within your budget. Joan Bogart's gallery is presently located in a suburb of N.Y.C. and is 20 min. from Kennedy Airport. Joan welcomes you to visit this 3000 sq foot gallery in Oceanside, NY. Unfortunately, her inventory is too extensive to put entirely on the internet, but she will send photos upon request. Joan looks forward to working with you.